Specially Formulated for Pond Winterization. Get Your Pond Water Ready for a Clean & Clear Spring! Microbe-Lift Autumn/Winter Prep helps accelerate the decomposition of leaves, sediment and other organic matter during the fall and winter months. 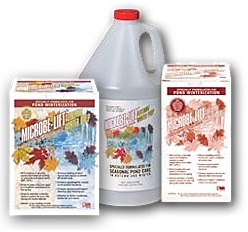 Microbe-Lift Autumn/Winter Prep will also jump start your pond to a healthier environment in the spring. Microbe-Lift Autumn/Winter Prep is a two-part system of liquid bacteria and dry, water soluble packets containing a blend of cellulase enzymes, cellulase-producing bacteria and a cold weather bacteria. The cellulase enzymes, along with the cellulase-producing bacteria, are the key to accelerating the breakdown of leaves, organic sediment and sludge all winter long. The cold weather bacteria and liquid bacteria take care of the initial breakdown by-products.